Venison is the meat of any species of deer, and as with most meats, it is cut into roasts, steaks, chops, and grind. Venison is not always available in markets, but you can purchase it online from a number of trustworthy vendors. Hunters are a reliable source (do make sure they've properly field-dressed the venison). This list is comprised of the deer commonly hunted for sport and prepared for consumption. Native to Sri Lanka and India, the Axis deer was brought to the United States in 1932 and now lives in the wild and on ranches throughout central and southern Texas. There is also a sizable population in Hawaii, where they are regarded as harmful to agriculture and hunters are encouraged to help control the burgeoning population. A beautiful species, Axis deer are reddish-brown with white spots and have a dark stripe (also spotted) that runs from the nape of the neck to the tip of the tail. Males have three-tined antlers and can weigh up to 250 pounds; females can weigh up to 150 pounds. Their natural diet consists of grasses, live oak, sumac, acorns, and mushrooms. Their meat is mild in taste, extremely tender, and exceptionally low in fat (0.2 percent). Axis deer is generally considered by most hunters to be the best-tasting game meat. The reindeer species is known as caribou in North America and is indigenous to arctic and subarctic climates. Caribou vary in size and weight, with males averaging 400 pounds. Both sexes grow antlers, although the males' antlers are larger. The color and depth of their fur are dependent on region and climate, but in general caribou fur has two layers: a thick undercoat and a long-haired overcoat, the hairs of which (similar to moose) are hollow in order to keep the deer warm. Caribou diet consists mainly of lichen in winter and tree leaves and grasses in warmer weather. Reindeer hunting dates back to 10,000 B.C. and is vitally important to many cultures for providing food. Caribou venison is very high in protein, very low in fat, and can be eaten fresh or dried. Elk is one of the largest land mammals indigenous to North America and eastern Asia, living in forest habitats with a diet of grasses, plants, leaves, and tree bark. Several sub-species of elk range in herds from Ontario to British Columbia in Canada and the northeast and northwest United States (although elk can also be found in Kentucky, Tennessee, and North Carolina). Elk ​are extremely popular for hunting due to their massive antlers (they shed and grown annually), which can weigh up to 40 pounds. They are very adaptable to climate and environment, but they are also susceptible to infectious disease, which can spread to farm livestock. Mature bull elk can weigh as much as 40 percent more than females, upwards of 730 pounds and even as high as 1,200 pounds in the Roosevelt Elk subspecies. Elk venison is higher in protein and leaner than beef, but it is high in cholesterol (a single serving has 83 percent of a daily intake allowance). Elk has a less gamey flavor than other venison and is often compared to tasting like beef but with a coarser texture. Fallow deer are one of the most common deer found throughout the world. Their origin is traced back to the Pleistocene era in North Africa before they migrated to Asia Minor and Europe where they were hunted for sport by the aristocracy, especially in the United Kingdom. Fallow deer are medium sized in height and weight (220 pounds for males, 110 pounds for females) and vary in color, from white to chestnut to black. Bucks have large, flattened, shovel-shaped antlers. They eat a variety of plants and grasses. Fallow deer are the traditional venison in European recipes, having a strong taste often counterbalanced by juniper berries and wine marinades. Red deer are native throughout Europe, Asia Minor, and the Caucasus region. The species is widely depicted in cave art dating back 40,000 years. Sizes of red deer are comparable to the North American Elk and vary by region with a mature stag measuring eight feet in length and weighing up to over 500 pounds. Stags annually shed and grow large antlers, for which they are often hunted. Red deer stags are also well-known for their roaring vocalization during mating season. The Red deer's natural habitat is forest land, where they browse rather than graze, preferring to eat oak and birch leaves, twigs, ivy, and lichen. Until recently, red deer venison in the United Kingdom was restricted to the aristocracy and royalty, but farm-raised red deer is now widely available in supermarkets. As with all venison, it is high in protein and low in fat with rich flavor. This is the most commonly used venison in British cooking. The moose is the largest species in the deer family and is native to North America, Russia, Scandinavia, and northern Europe. The moose adapts to both temperate and Arctic climates, and its diet consists of both aquatic and forest vegetation. The name "moose" translates from the Algonkian word for "twig-eater". Males stand six feet tall from shoulder to foot and can weigh up to 1,600 pounds; females weigh up to 1,300 pounds. Their thick, light or dark brown fur is composed of hollow hair, which keeps the moose warm in winter and Arctic weather. The bull moose is renown for its enormous antlers, which can stretch four to five feet across. Moose-hunting is extremely popular for sport but also for harvesting venison, since a bull moose can yield over 900 pounds of meat. 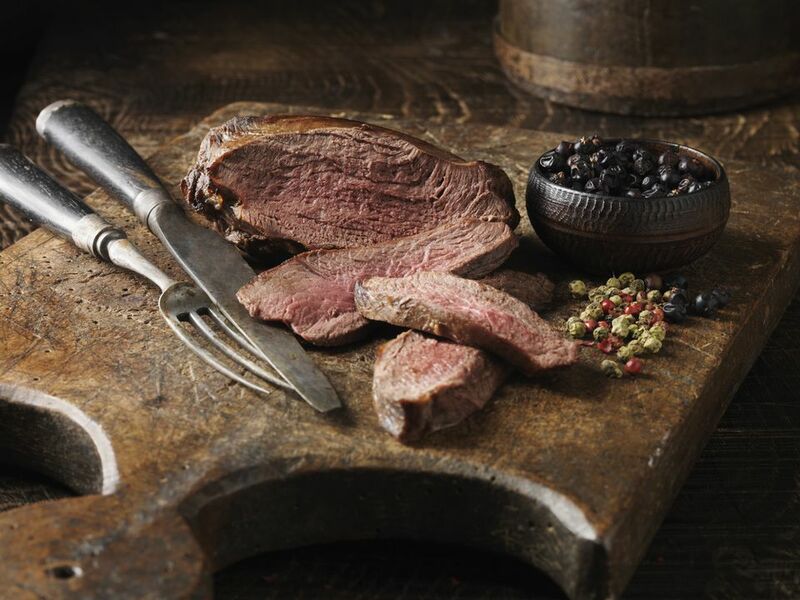 Moose venison is high in protein, low in fat, and is similar in texture and taste to lean beef or bison. Moose meat makes great steaks. The mule deer, so-named because of its large ears, is native to the western United States in the Rocky Mountain region. They are small-to-medium sized with the bucks averaging 200 pounds in weight; females average 125 pounds. The mule deer's antlers differ from other species as they grow forward in a fork shape. Another unusual characteristic of the mule deer is that it doesn't run, but rather leaps in the air—at times, eight feet high—and lands on all four feet, behavior that is called "stotting". The mule deer is not adaptable to changes in climate, falls prey to many natural predators, and is also the deer most commonly killed by vehicles. Its diet consists of plants and berries in summer, conifers and brushes year-round, and sage in winter (which imbues an unpleasant taste and gamy flavor to its meat). Mule deer is a favorite with sport-hunters, but it is not preferred for its venison. The South Texas or Nilgai antelope was imported from India to a Los Angeles zoo in the 1920s, before being introduced to south Texas by a wealthy rancher who released them into the wild. The more properly named Nilgai (meaning "blue bull") gets its name from the blue/gray-colored male, which can weigh up to 600 pounds. The females (and calves) are light brown and about one-third smaller. Nilgai ​fare poorly in colder climates, being indigenous to hot, dry, savannah environments, but they acclimated well to the temperate south Texas climate. Their natural diet consists of grasses, seeds, and fruits, although when food is scarce, they are not particular about what they eat. Nilgai antelope are skittish and strong, characteristics that make them a challenging hunt. Nilgai or South Texas Antelope venison is favored in restaurants for its veal-like texture and light flavor, which is even milder than beef. Nilgai is lower in cholesterol than chicken and contains one-third the calories of beef with less than three percent fat. Sika (pronounced "shee-kah") deer are a compact, "dainty-footed" deer indigenous to Japan that has been successfully introduced into many countries, including the United States (Maryland, Virginia, and Texas have large wild populations), because of their rapid hybridization with non-native deer. 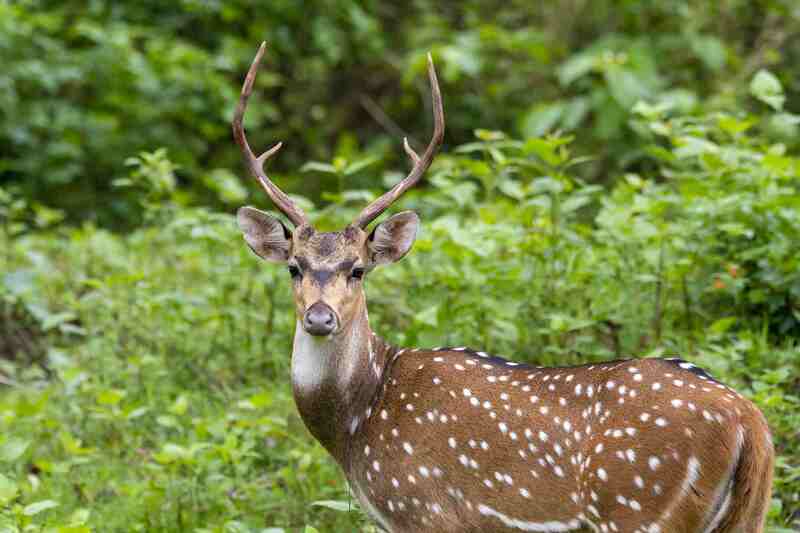 Abundant and clever, the sika deer's unusual survival instincts make them popular for sport-hunting. Native forest-dwellers, sika deer graze and browse (they are considered a threat to Britain's woodland areas), eating grasses and leaves. Their coats vary in color from brown to mahogany with white spots. Stags are prized for trophy hunts as their impressive antlers can have up to eight tines. Sika venison is a strong-flavored darker meat, which is often described as similar in taste to elk. The white-tailed deer is small-to-medium in size with reddish coats in spring and summer, and gray-brown coats in fall and winter. The deer is named for its long white tail that it displays when sensing danger or threat. White-tailed deer are commonly hunted for sport and venison, which has a characteristically gamey flavor, although its flavor is lighter in taste than other species (for example, the mule deer) and is very dependent on the deer's diet.